To be a Catechist is a gift, to you and others! The Parish of Christ the King offers a support system to all parents through the Faith Formation Program. Using dedicated catechists who volunteer to work with parents for the catechesis of their children, the program will help spread the Gospel message of Jesus Christ. 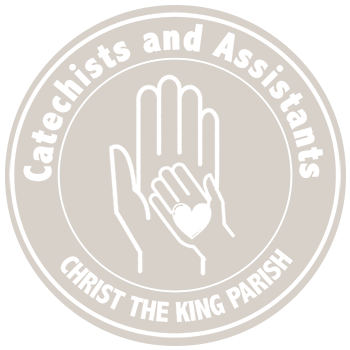 In order to assist parents, the Parish of Christ the King provides opportunities for ongoing faith development, through Adult Faith Formation programs and parent meetings designed specifically to aid parents in the sacramental catechesis of their children. Catechesis is derived from the Greek word meaning “to echo or resound” or “to sound from above”. The word echoed or resounded through catechesis is the “Word” of God made flesh – Jesus Christ, and he gives us his “word” through Sacred Scripture. Catechists assist individuals and communities to acquire and deepen faith and identity through initiation rites, instruction, and the formation of conscience. Parents and catechists do this by resonating the “Word” of God in their very life. Through Baptism, the whole Church is called to participate in the mission of catechesis.